When the Bible is mentioned the first thing you think is; a religious book. However it is more than that, for the past few days we have shared lessons that demonstrate Deuteronomy 28 is our history. 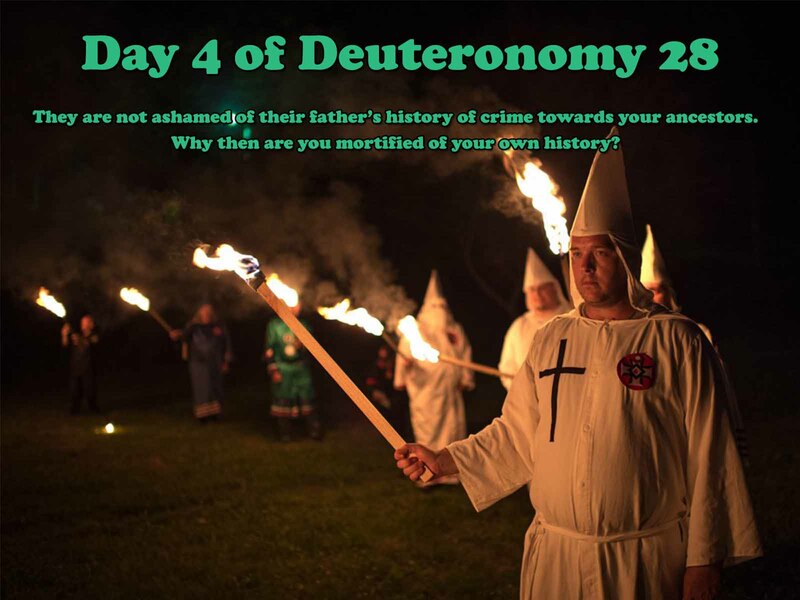 For the 4th Day of Deuteronomy 28 we have to ask ourselves, why any other time our people are not interested in their history? Why do people feel like the past is not important to know? A common sayings is that we should forget about slavery or the systematic discrimination of Jim Crow. Ecclesiastes 3:15 “That which hath been is now; and that which is to be hath already been; and God requireth that which is past.” We should think things through before we start using sayings that society only applies to you. Imagine the ramifications if we start applying that philosophy to every aspect of life. Start with forgetting about pay for the work you did the past week, month, or year. Of course you wouldn’t want that to happen but it is a possibility if we start believing that nonsensical saying. Look at Hungary’s ‘slave law’ that passed in December of 2018; although they are not our people it sets a precedent. That is nothing compared to the slave auctions that are currently happening in Libya. Therefore do not be uncomfortable with the history of our people become discomfited by our present day.